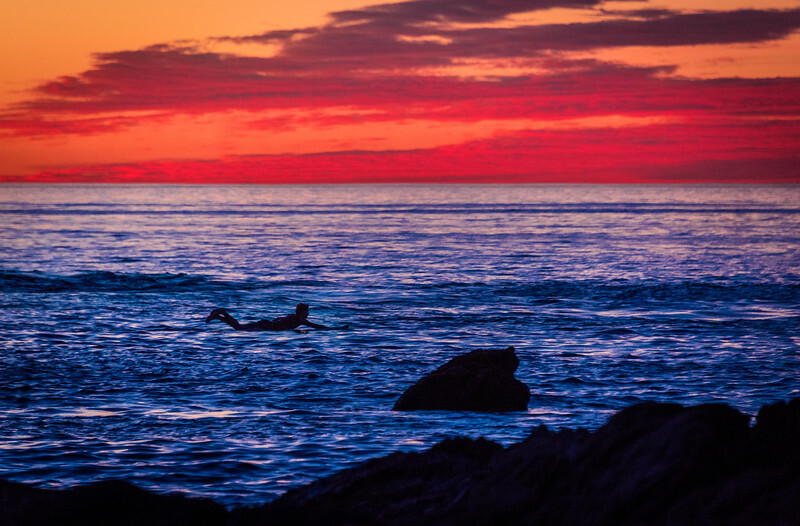 Continuing my series of the best beaches in California is Pearl Street Beach in Laguna Beach. This post contains photos of Pearl Street Beach, tips for finding it, and some info about the beach. Pearl Street Beach is a small spot with reefs comprising both the north and south rims of the beach. 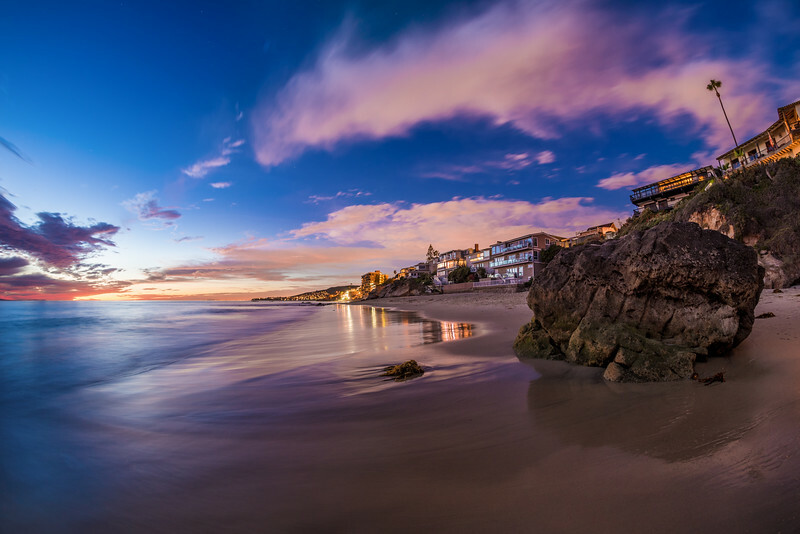 I previously covered Laguna’s Victoria Beach, and Pearl Street Beach is another “South Laguna” beach approximately .75 miles north of Victoria Beach. You can see where it’s located on this map showing the various beaches in Laguna Beach. The main draw at Pearl Street Beach is Arch Rock, pictured above. Archways like this are not atypical in Laguna Beach, but I think this one is fairly unique in that it has a really light, earth-tone, and from the north side on Pearl Beach, it almost looks like a tropical island setting. Birds flock to the top of Arch Rock, and people flock all around its base, which you can pass through on foot to reach the tide pools and Cactus Point on the other side. 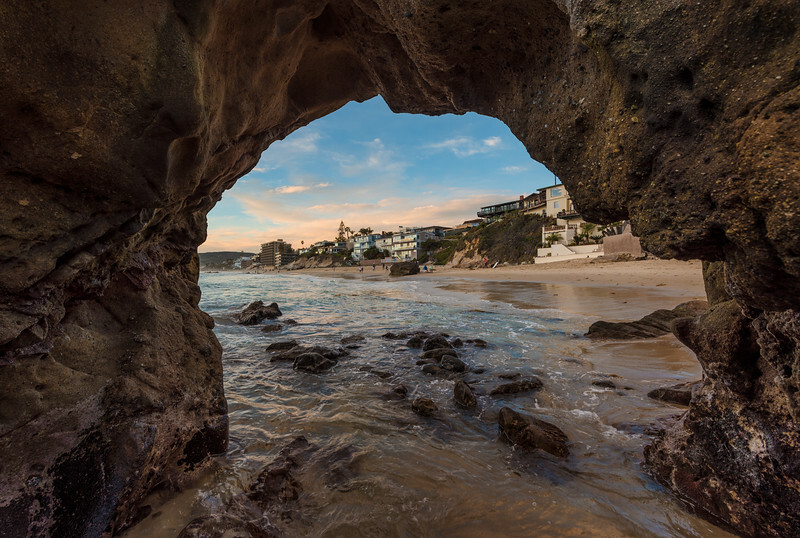 In addition to Arch Rock, among the tide pools there’s a blowhole through which you can swim–I’ve never done this as I always have my camera gear along with me, but it looks pretty cool. Like Victoria Beach, Pearl Street Beach can be tricky to find if you don’t know what to look for. There is a set of stairs down to this beach tucked away in a residential area without any signage indicating where they are. There isn’t parking in the residential area near the stairs, and unless you want to pay for metered parking outside the neighborhood or along the Pacific Coast Highway, I’d recommend driving down Pearl Street on the other side of Pacific Coast Highway and finding free street parking on a side street about 10 minutes away. Once you cross the Pacific Coast Highway and are heading down Pearl Street, you’ll curve around to the north, onto Ocean Way. From there, you’ll come to a gap in the guard rail along the road, and that’s where you’ll find the stairs down to the beach. You can see this location on Google Earth here. From the bottom of those steps, you should see Arch Rock to the south. Surfing isn’t permitted at Pearl Street Beach, but just about everything else seems fine. What I like about this beach is that it has both a normal sand beach area and also some rocky coastline, making it a great option for sunbathing and relaxing, or taking photos and exploring the coastline. The item of visual interest is obviously Arch Rock, but there are a couple of large rocks and some other things scattered around the beach. As compared to Main Beach, Pearl Street Beach is far less tourist-y, and although I’ve seen other locals here the couple of times I’ve been down to this beach, it is never crowded. The atmosphere is pretty quiet and relaxed, with the most “action” around Arch Rock as people pass through it, climb over it (which technically isn’t allowed), and wander out around it. Have you been to Pearl Street Beach? What do you think of it? 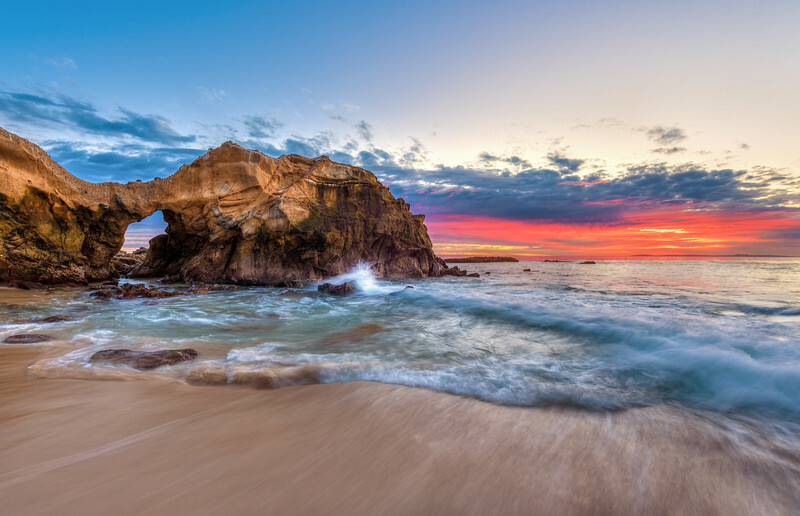 Have another favorite secluded beach in Southern California? Interested in finding this pirate beach? Have any questions or other thoughts? Please share below in the comments! Great shots of Pearl Street. While this is a niche topic for most I am really head over heals with these posts. My family and I are headed towards CA this summer and my trip planning is really giving me a pain. Maybe if you would let me I can throw a few ideas I have and see what you think, if you don’t mind? Things I really want to hit this year are Santa Barbara, Julia Pfeiffer State Beach, Walt Disney Family Museum, Yosemite, and DL’s 60th Celebration. We have approx about 10 days and I’m pretty sure Yosemite and DL will take up 6 with three each afforded to both. The problem for us is that we are a party of five and I’ve studied just about every hotel up and down the coast. Do you know of any good sites for hotel planning other than tripadvisor? How much time should I give to Julia P State Beach, Santa Barbara, etc. Are they both worth my time? I’m afraid I might have to give up WD Fam Museum as much as I want to visit it. We have already crossed off Lake Tahoe because we are just doing too much driving already. Thanks again for the photos you’ve posted and the ones to come. Take care. How much time this will all take really depends upon your aim. Santa Barbara, Big Sur, and a number of other coastal draws are all *right* along the PCH, and you can spend as much or as little time as you want seeing/doing the various things there. 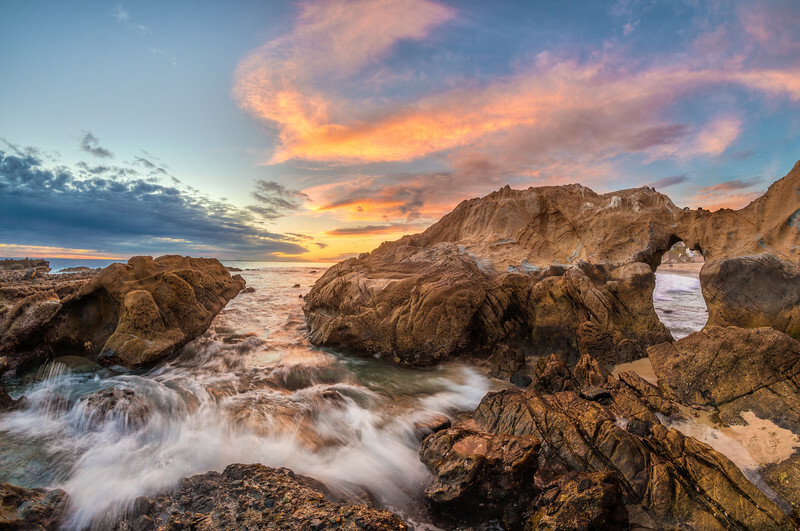 For example, you could take 30 minutes at Pfeiffer Beach from the time you pull off to the PCH to the time you pull back on if all you want to do is see it, snap a few photos, and go. You could spend half a day or more there if you want to hike, watch the sunset, set. How much time *you* need there is largely a personal decision. I think you could easily get away with devoting 2 days to traveling the PCH from NorCal to SoCal, allowing you to stop wherever you desired and slowly making the trip while still keeping WDFM for 1 day.